Our weekend place at the beach has quite a bit of glass… large sliding glass doors can be opened and the living area feels like you are almost living outdoors. The set up seems to be a major problem for neighborhood birds. When we are there and the doors are open, birds often fly through the living room, but when the doors are closed, clean and reflecting the outdoor sky and scenery, it turns into the birds worst nightmares. A couple of years ago, this cute baby kingfisher slammed into a closed glass door, and after catching its breath, took off, hopefully the wiser. 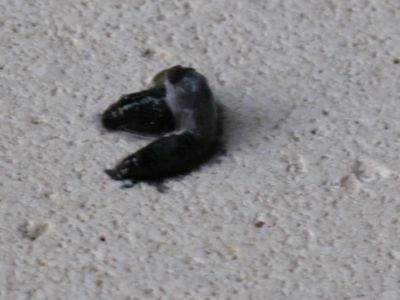 On a recent trip, while I was sitting in the living room reading the papers, this maya bird slammed into the closed doors at full speed, bounced off and landed on the sandstone flooring. At any rate after about a minute or two, the birds beak finally closed, and it looked like it had regained its composure. I managed several more close-up shots, and as quickly as it slammed into the glass door, it took right off and flew to a branch in a nearby kalachuchi (fragipani) tree. I was relieved it was well enough to fly, but worried it might have sustained some nasty internal injuries. P.S. this is the first of 3-4 bug and animal posts coming up in the next two weeks. Not sure why the summer has brought so many of these photo opportunities… but they depart from the food theme of the blog for sure. MM, those poor birds cannot tell that there is glass instead of open space. It is their instinct to fly through what appears to be open space. 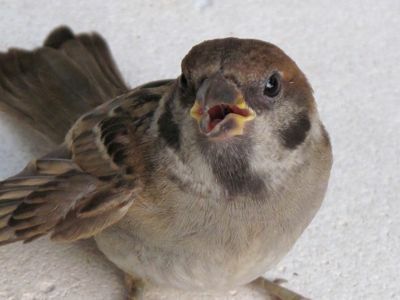 What you can do to minimize injuries to these poor creatures is to either keep your glass doors open during the day to allow the birds to zip through. Or to install cloth blinds or shades on the upper half of your doors. It may partially obstruct your view but it will keep the birds from breaking their necks. After all the birds were there before you built your house. Technically they have jurisdiction over the open airspace. If you don’t want them to invade yours, let them know where the boundaries are. i have a floor to ceiling windows in 2 sides of my house and these kinds of things happen a lot. a neighbor who is an elder british gentleman suggested that i stick one of those bird stickers (size of a small bird) in the glass window to prevent other birds from slamming into the windows. apparently, the presence of another “bird” in an area makes other bird more alert thus they could then perceive the glass windows… in my case, it worked perfectly! Jack, that’s a great idea.Now I have to look for that kind of sticker at the stationary shop. I hope I won’t give you any ideas, but Bourdain had sparrows in Laos, while Zimmern had those barbecued in Cambodia. Not sure if a scarecrow would work too. I have to let you in on a secret…I have this irrational fear of birds – any kind of birds, but esp. pigeons and seagulls. They’re cute, but I can never pick the up or hold them. Random but I thought maya-maya is the fish and maya is the bird? yes, silvergirl, that is a Maya bird, the original national bird before it was changed to Phil eagle and the Maya-maya is a delicious fish for escabeche.. MM, how about changing the clear glass to a smoked glass? Hehehehehe, it must have hurted so bad :( that the poor bird gave a involuntary gift for you to clean up :) If only it could cry! I know how the Maya feels, this happened to me about 10 years ago at the Home Depot in Ortigas. I was shopping for home improvement stuff when bang-smack I ran into a glass wall! I had hit my forehead with such force that I fell on my bum and was bleeding on a cut between my eyes. A saleslady saw me and gave me a tissue! I had to drive home bleeding. So more power to you little bird! Bird strikes on windows kill millions, yup millions of birds every year! All they see is the reflected expanse in the glass and WHAM! A bat on the other hand actually uses echolocation and sends out sounds we can’t hear and the speed that it bounces back to the bat lets him know where things are and thus avoid them. As my friend ‘Anne’ up there mentioned with the link, there are studies that gridlines with highlighter (only yellow or orange) are a way to prevent bird strikes – the highlighter is barely visible and easy to see past and ignore. It does however need to be reapplied as the UV fades it pretty quickly. Another way would be to have blinds installed and keep them open so that it looks like there are lines breaking up the expanse of your windows. Stickers don’t work very well because as long as there is negative space between the stickers (or gridlines for that matter) the birds will still try to fly through it. As for what to do when the inevitable happens, majority of the time, the bird is simply stunned and just needs a moment to recover. Simply watch the bird, give it some space and watch it fly off when it is ready. If it is in direct sunlight or you are afraid that something (like your cat) will eat it, you can pick it up gently and put it in a shoe box with a hole in the side so that it can rest up and fly away at its leisure. As with any head trauma, the last thing it needs is a lot of handling and movement, and neither does it really need food and water at that time. 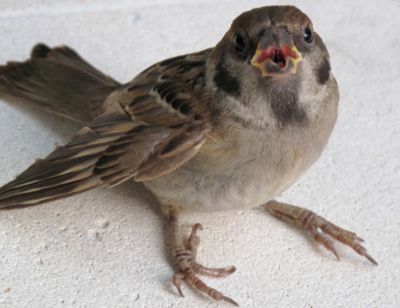 There are places that fix injured animals (in North America at least) but a tiny songbird is pretty unfixable, can you imagine pinning a fracture on a Maya? As for its big giant poop souvenir – classic stress relief poop – similar to your “after a long flight – now I feel so much better” cork poop! @Jen Laceda – hey classmate, you can come visit me sometime and see my hawks that fly right above your head … so close that the wind their wings create will part your hair! Maybe we can work on your irrational fear of birds …. by introducing you to some awesome raptors! We did some birdwatching back in college, and as I was reading your post, I somewhat remember being told by a biology instructor that this not actually the “true” maya, as in the former national bird of the Philippines. 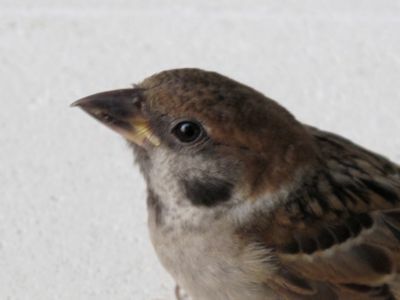 So I googled it, and true enough, this is the “false” maya, Passer montanus, otherwise known as Eurasian tree sparrow. The “true” maya is Lonchura atricapilla, also known as “maya pula” or chesnut/black-headed munia. See a picture of it here: Black-headed Munia. A lot of pet birds are appearing everywhere here being let loose by owners who couldn’t find somebody to take care of them now that the summer vacation is drawing near and people are going on a trip abroad! Poor birds! ykmd, you are too funny! Yep… I too did a double take when I saw the title for this blog entry…was I the one in need of contact lenses? :) … I thought – isn’t maya-maya a fish? Maya or Pipit (is the other popular name) is the bird…. reminds me of a friend who said to some foreigners after asking what maya-maya is… she said it’s our national bird… LOL!!! But neat pictures of a little cute bird! does the yellow around the beak – means that it’s still a baby? At least the bird was able to fly away…. Hi Roland. Yes, the yellow edges on the beak do indicate that it is still a youngster. It appears to be full size already though. It just takes some time for all the yellow to go dark and to harden up fully. MM, we have glass windows here at work and they put bird silhouette black decals on it so the birds won’t fly into them. It doesn’t have to be neon or bright colors. So long as you put the decals, I guess this will make the bird aware that it is glass and not open space. This trick is actually pretty cool since I sometimes see some birds hovering by the window… as if looking in the mirror. Good luck! And nice pictures, BTW. I feel for the bird–I’ve walked into our freshly-washed sliding glass doors a couple of times. My nose has taken a beating. Glad your bird was okay. Hi Jean – the simplest solution is to not feed them … wild animals can find food and shelter for themselves and really do not need our help. Where I work, we get calls all the time from people that say, how do I stop the ____ (deer, squirrel, birds) from coming into our yard, and then we find out that they feed them – so of course they stick around. Bottom line, don’t feed wild animals. to the second floor. I gave it to the ES office. I bet a few tasteful decals from a home improvement store would provide enough perceptive warning to both wayward birds and humans. MM, that poop might have been the result of an involuntary movement. A few months back, we were witness to a similar situation. The bird was bigger and when it bumped into the glass, it threw out its stomach contents, broke its neck and fell dead on the floor. I, too, wondered if decals would work with birds. Poor bird. reminds me of that scene in the movie “The Core” when their flight patterns were augmented by pole shifting. But BP oil spill is worse for these creatures. I’m very hurt that someone would see a problem with apart of their home killing or injuring animals and not taking immediate action to change the problem. I do thank you for providing me with the name of the birds I enjoy every morning. “Maya” I hope you have made the necessary changing to end the harm your home is causing.